Welcome to the lodge! Sit around the fire and visit. Eastern Delaware Nations (EDN) is a group of Native American descendants who seek to gather scattered people of Delaware and related heritage, restore traditional culture, and promote cultural awareness through education. Pictured above: Wyalusing Rocks Scenic Overlook, also known as "Prayer Rocks," on Rt. 6 near Wyalusing, Pa.
Eastern Delaware Nations was first incorporated in 1984 and achieved Federal Non-profit 501c3 status in 1993. The Eastern Delaware Nations is not "recognized" by Pennsylvania or the Federal Government as a tribe. Grandfather Wayandaga (pictured above), the Eastern Delaware Nations first Chief, dreamed of buying back sacred land know to the people as Wyalusing Rocks. 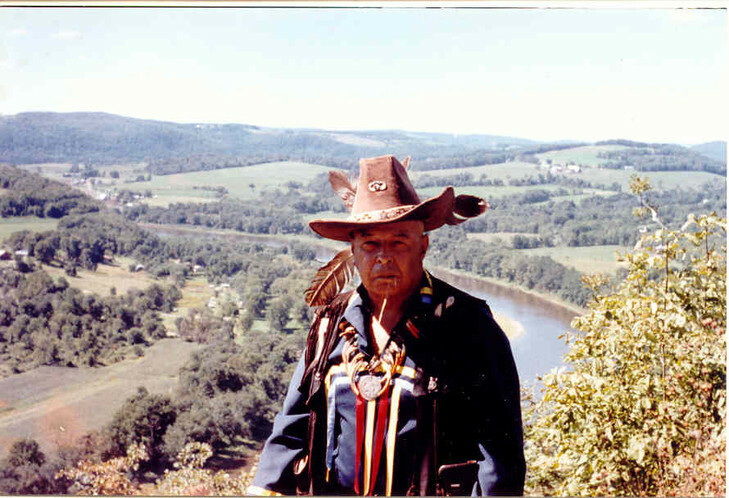 In 1999, Eastern Delaware Nations purchased approximately 14 acres of ancestral land straddling Route 6, two miles north of Wyalusing, Pa.
Chief Wayandaga, served the Native American communities of New Jersey and Pennsylvania. He was one of the founders the United American Indians of the Delaware Valley and Eastern Delaware Nations in Pennsylvania. A traditional Nanticoke Medicine Man, he was a direct decedent of Sachem (Chief) Wi-Daag, who signed the first treaty with William Penn. This site includes the historic Wyalusing Rocks scenic overlook, featured in National Geographic's Appalachia Geotourism Map. This is a place to learn, share our heritage and culture, pray, and be together. 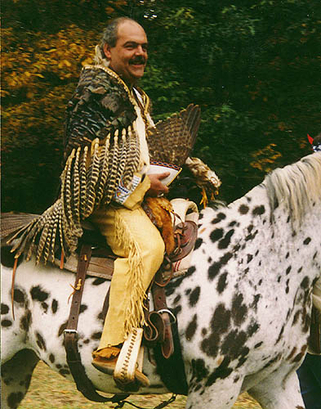 Chief Mike Medicine Shield Taffe (pictured above) was ordained Tallak of Eastern Delaware Nations on December 27th, 1992. The ordination ceremony took place at the gravesite immediately following the funeral of Chief Wayandaga. Upon completion of this ceremony Chief Mike Medicine Shield became Grandfather and Leader of our Community.